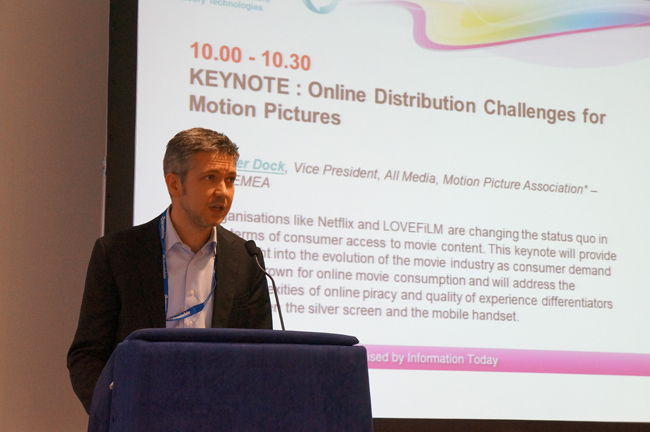 The inaugural Video Infrastructure Summit, a precursor to this week's Streaming Media Europe 2012 conference, takes place today at the Hilton London Olympia hotel, and kicked off with two strong keynote addresses. 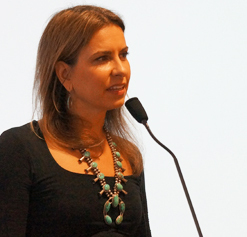 First up, Maria Ingold, technical consultant and owner of Mireality, delivered insights on the workings of over-the-top (OTT) movie distribution. Next, Olivier Dock, vice president for all media, Europe, Middle East, and Africa, for the Motion Picture Association, spoke about the challenges piracy presents for movie distribution online. Delivering online doesn't have to be costly, Ingold told the audience, but the various participants -- including retailers, suppliers, content providers, and, of course, customers -- all have differing needs that have to be satisfied. Retailers want to deliver to the widest audience, while suppliers are concerned with the details of delivery; content providers worry about security (and take 70 percent of the revenue), while customers simply want every movie, right away, on every device. Online availability is limited by movie studio release windows, and Ingold provided a helpful graphic showing the windows for different markets and giving the time period for each. Accessibility windows are compressing, Ingold said, bringing premium content online sooner, but there are obstacles. The studios' attempts to shorten the theatrical release window, for example, has so far met with strong pushback from theater owners. Studios view the last half of the theatrical release period as the piracy window, Ingold said, and want to shorten it so that customers have legal streaming options sooner. Walking the audience through the video-on-demand infrastructure, Ingold explained the needs of content providers, offered best practices for media asset management systems and content management systems, and talked about concerns in publishing material and delivering it to viewers. That's not the end of the workflow, as OTT providers then need to monitor and maintain their services, create detailed reports on delivery quality, and develop new services. Offering a look at future OTT trends, Ingold gave numbers on how streaming through gaming consoles to living room TVs will grow, and showed how increasing tablet video use is taking the place of paid streaming on desktop and notebook computers. Following Ingold was Olivier Dock, who gave a film industry view of the online market. Most movies don't recoup their costs in theaters alone, Dock said, relying on multimedia delivery. The film industry embraces change, he said, and doesn't see the internet as doomsday for movies. Still, piracy is an ongoing problem, and pirates enjoy vastly better economic conditions than legal channels since they don't pay license fees for the films they stream. As a result, they're much more profitable than legitimate sites. That creates an unhealthy system where companies have less revenue to invest in new business models. "The internet is not a rules-free zone," Dock said, concluding by saying countries need to take steps the change that imbalance that favors pirates.